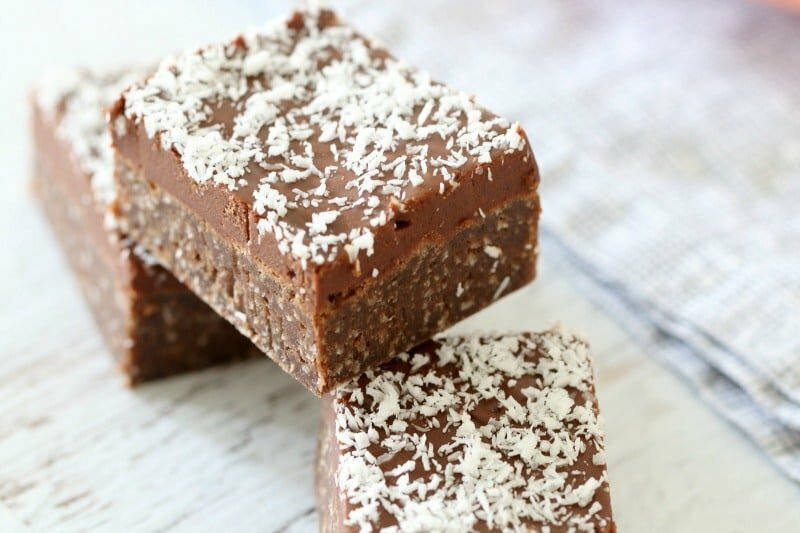 Make this Easy Chocolate Coconut Slice in no time at all – simply melt & mix! Conventional and Thermomix instructions included. A few weeks ago, one of of my best friends had her second baby. Before I went to visit for lots of bubba cuddles, I asked if there was anything she wanted me to bring over… her answer – chocolate! You can see why we’re friends! Anyway, I thought I’d go one better and make one of my favourite chocolate slices. 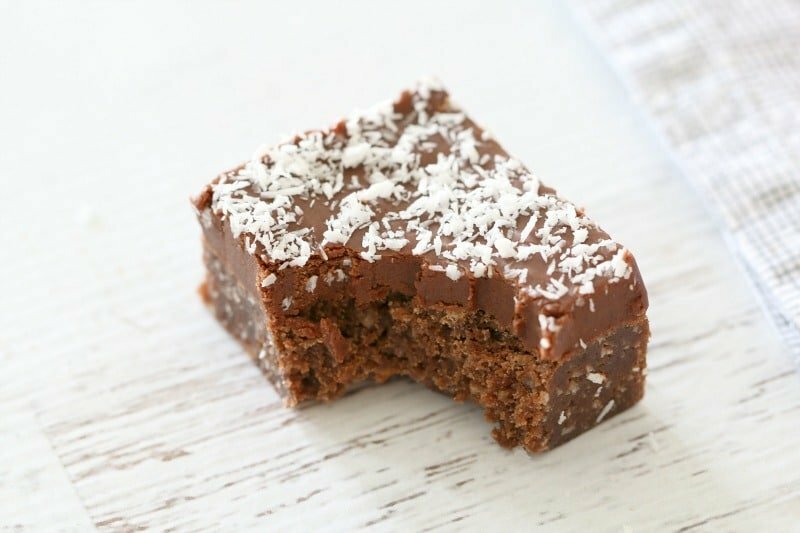 If you’ve never made this Easy Chocolate Coconut Slice before, then you are really, really missing out!! This was actually one of the very first recipes I ever put on the blog, but after two years, I thought it was time it had an update, or a foodie makeover… because every good recipe needs a makeover now and then. 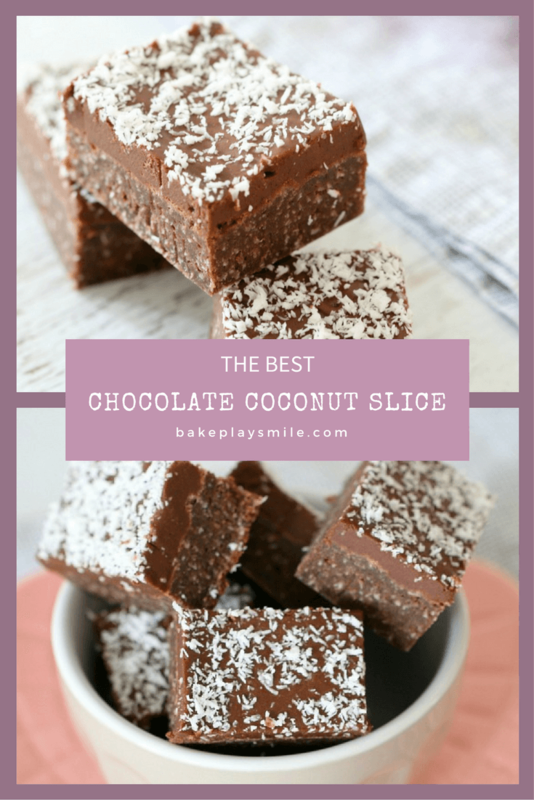 The thing I love the most about this slice is that you probably have all of the ingredients in your cupboard and fridge – which means no extra trips to the supermarket (am I the only person who seems to live in the supermarket?). It’s also the simplest thing ever. You literally just ‘melt and mix’ the ingredients in the base, pop it into the oven, and then spread the icing over the slice. I like to spread my icing on while the slice is still warm, in fact when it’s just out of the oven, because the heat of the base makes it so easy to spread. As you can see by the pictures, this recipe makes quite a lot of icing, so leave a bit off if you’d rather a thinner layer (but come on… it’s icing and who on earth can say no to thick icing?). 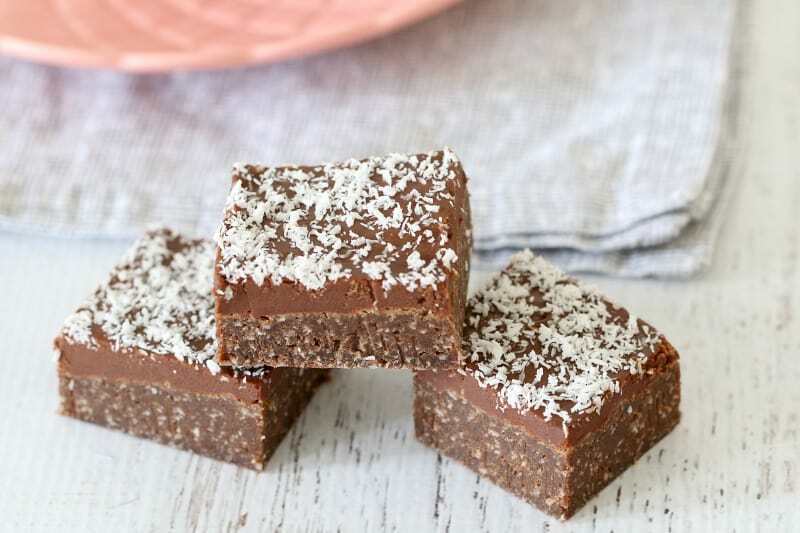 So whether you’re making this slice for yourself, as a great little lunchbox filler, or for a friend who’s just had a gorgeous little bub, you really can’t beat this easy chocolate coconut slice. Puh-leeeeze make it, make it, make it!!! Trust me on this one – there’s simply nothing better! 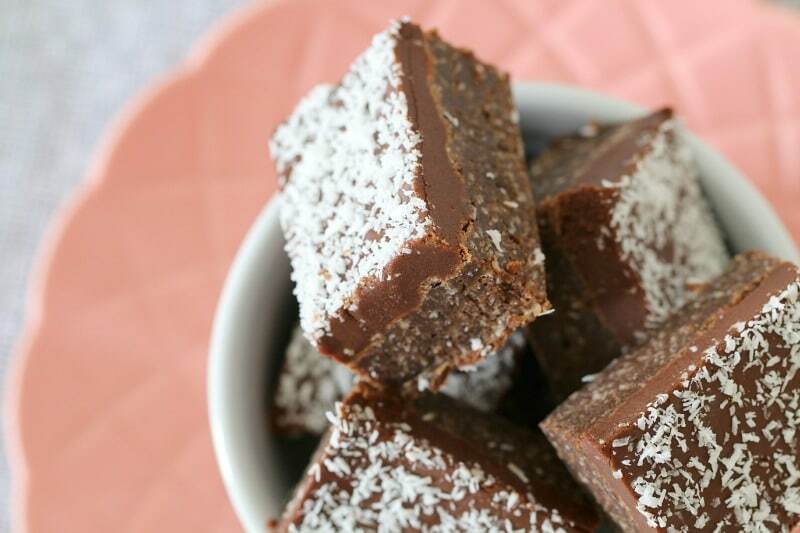 Make this Easy Chocolate Coconut Slice in no time at all - simply melt & mix! Conventional and Thermomix instructions included. Grease and line with baking paper a 20x20cm square tin. Place butter, sugar, egg and vanilla in a bowl, stir until combined. 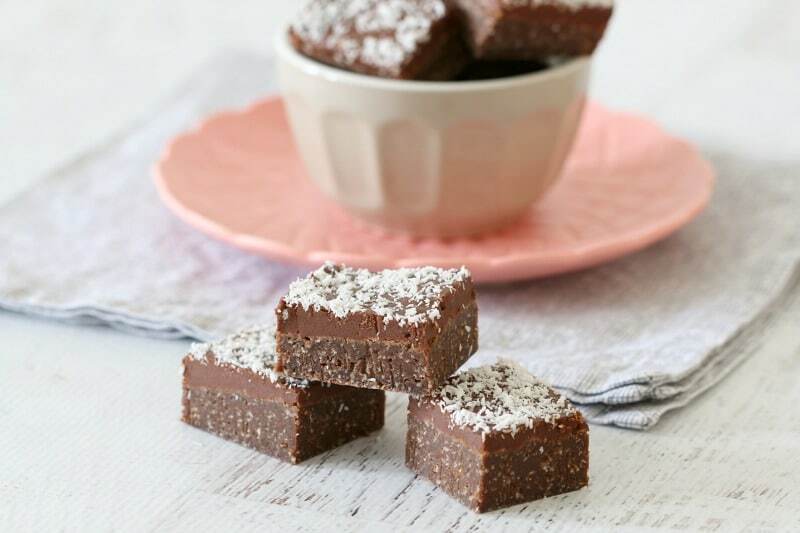 Sift flour and cocoa into bowl, add ½ cup coconut. Stir until mixture has combined. Bake for 25-30 minutes or until just firm. Add butter and boiling water, stir together. Spread warm slice with icing. 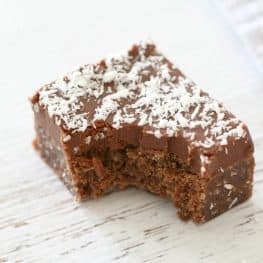 Sprinkle remaining coconut over slice. Place butter into the TM bowl and melt for 3 minutes, 100 degrees, Speed 1. Add the sugar, egg and vanilla to the TM bowl and mix on Speed 5 for 20 seconds. 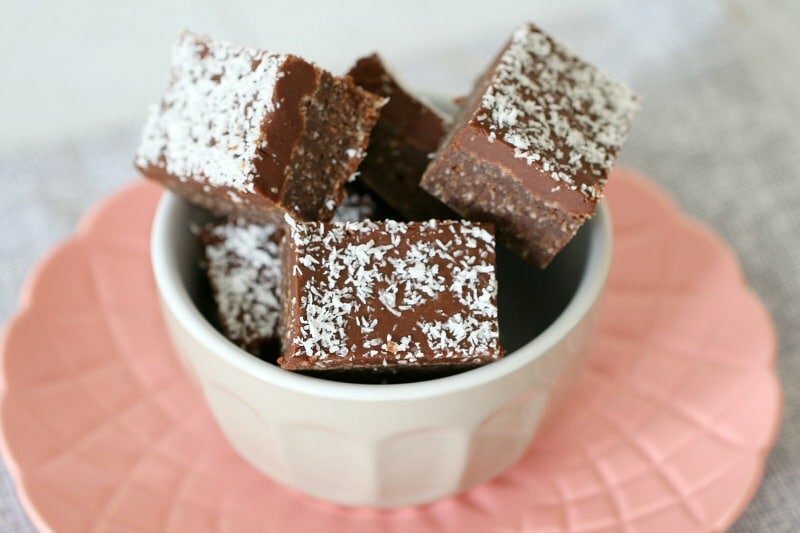 Sift flour and cocoa into the bowl and add ½ cup coconut. Mix on Speed 2 for 20 seconds or until mixture has combined (use the spatula to assist with mixing). Place the icing sugar and cocoa powder into the TM bowl and press Turbo 5 times to sift. Add butter and boiling water. Mix together on Speed 5 for 15 seconds or until smooth (add a little more water if the icing is too thick). Sprinkle remaining 2 tbs coconut over slice. It’s official! You are the Queen of Slices! This looks totally ace! I just made the chocolate slice. 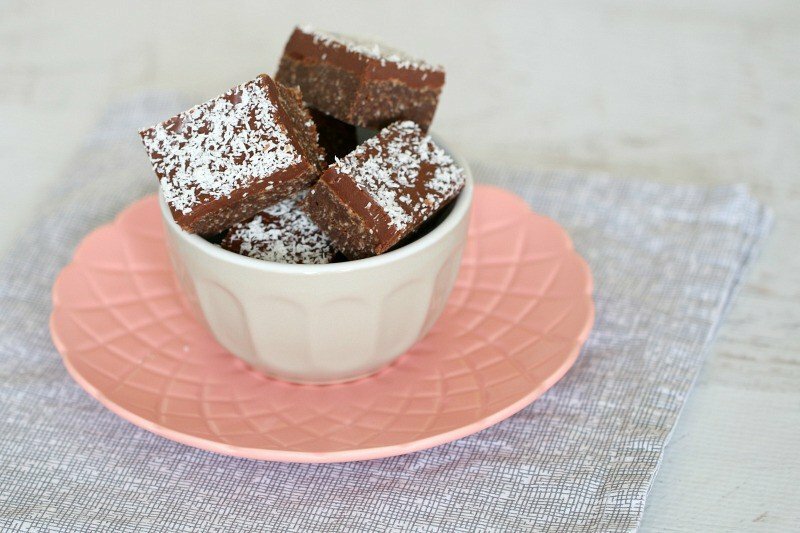 Very easy and very yummy and my friends kids loved it. Thank you for the making my pants fit again. They were a little loose and they doctor did say the other day that there was far to much blood in my cholesterol system anyway. But will soldier on…cant waste it. Hahaha I love that!! So glad your pants now fit! Sent these with my friend who works in a hospital. I added raspberries (chopped) and they were awesome. Yum! I’d make that today except I’d have to go and buy the ingredients, and can’t be bothered!! Looks great tho!! Oh no!! Maybe tomorrow then Lydia! This slice looks magical Lucy! Perfect for a sweet tooth like me. And those perfect edges – swoon! Thank you so much Jess. Hahaha yes I love that you are slice cutting obsessed too! 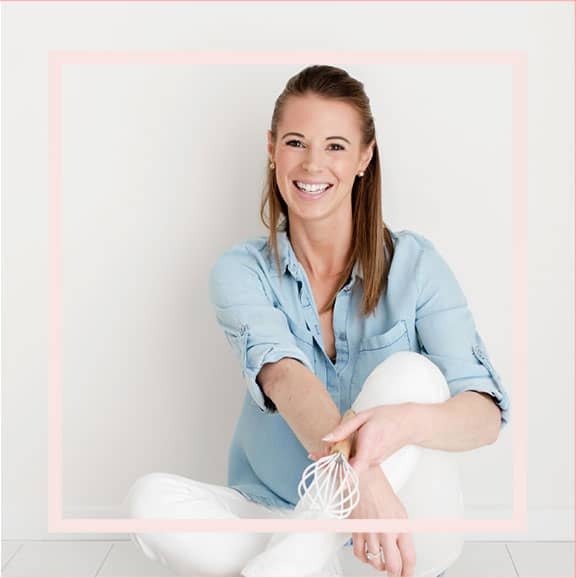 Oh definitely do Jody – you and your kids will love it!